It is a water-repellent product, resistant to sweat and to water contact, that is not thus removed during the games by the sea/lake shore or at bath time. 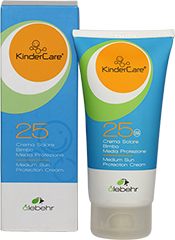 It is formulated to protect the skin of children from UVB and UVA solar radiations through photostable sun filters, the latest generation of organic filters and the perfect mix of micronized physical filters for a very pleasant texture. It performs a trophic action allowing the horny lamellae righting and optimizing their firmness. The product has excellent soothing and anti-reddening skills, important for an after sun. 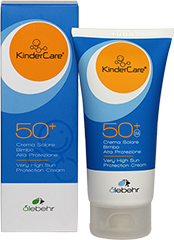 It is expressly recommended after the sun exposure and/or after the bath of the baby because his skin has not mature sweat glands, it tends to dry and it is not very waterproof, as well as particularly sensitive to sunlight. 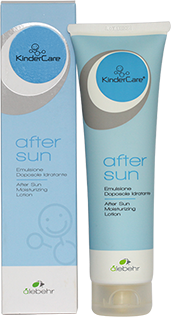 The Moisturizing After Sun can be used any time to maintain the skin of the baby soft and perfectly hydrated, especially after the sun exposure. Moreover, the presence of an extract of micronized Propolis also provides the skin a natural component that, through a sanitizing process, keeps epicutaneous bacterial species under control, guaranteeing the correct state of surface hygiene with an active protection that lasts even after the contact with water.